To honor moms during the Month of May, I'm posting prayers especially for moms and this post is the final post in this series! I pray it ministers to you in a special way! Thank you for all you do! Here's the final prayer for this month through Psalm 121:1-2. Heavenly Father, I thank You for Your truth, for building me up and daily transforming me as a mom and as Your Daughter as I read Your truth and pray through it. I thank You and praise You for Who You are, for loving me unconditionally and for being my true source of help! Thank You Father! Heavenly Father, You're Word is true. Your Word gives me hope and a deeper connection and direction with You day-to-day as Your daughter and servant and as a mom. Parenting / being a mom sometimes is a challenge as I work to help my children grow each day and navigate life but I know You equip me and strengthen me for each unique circumstance. When troubled times come - no matter what it is or what shape or size it's packaged in, help me to lift my eyes up to You. Help me to fix my eyes on You and not my circumstances. Help me to teach my children to do the same as I am a living example for them. Help me to rely on Your strength at all times. Father, when my vision gets blurry and I need Your help...please remind me to turn to You. If I ever question, help me to seek answers from You! Help me seek answers in Your Word. Father, I'm overwhelmed by Your love! I'm in awe of You as You're The Creator of Heaven and Earth yet... you still have time for me! 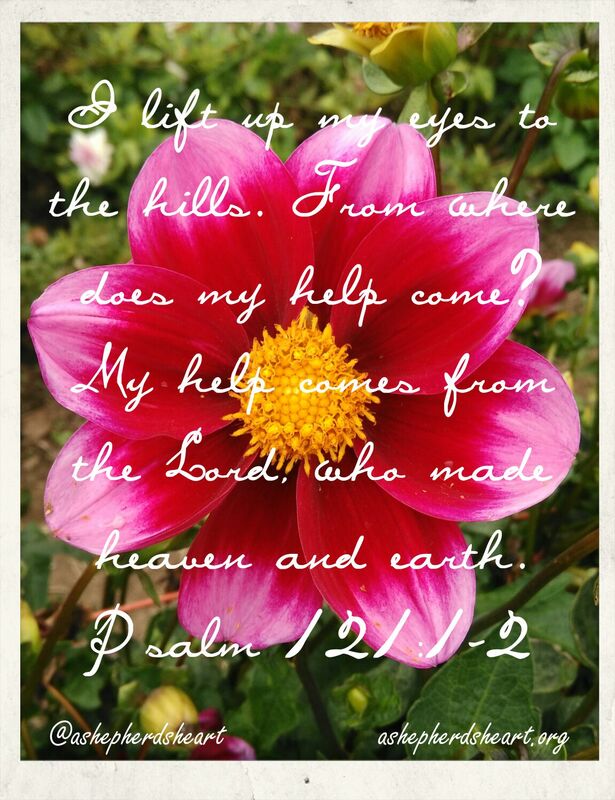 Please help me to remember where my help comes from as sometimes I lose sight of You...I lose sight of the truth. When the bills are due...Help me cling to Your help. When my child is getting sick in the middle of the night...Help me to cling to Your help. When I'm dealing with parenting issues...Help me cling to Your help. When I have no energy left in me...Help me to cling to Your help. No matter what I face...please help me / us to cling to Your help! Please help my children do the same...again as You help me model this day-to-day! Help me to continue to marvel at Your amazing handiwork. I praise You and thank You and I ask all these things in Jesus Name, Amen. I pray this Month's prayers through a different Psalm has been an encouragement and blessing for you. It's been a privilege to pray along with you and try to encourage you along the way. Keep striving to continue to be the awesome servant of the Lord and mom that you are! Thank you for all you do as you're family wouldn't be where they are without your tireless efforts!